The Empower Program includes WaterofGod National Prayerline, Bible Book Club, and LivingH20 TalkRadio. The Embrace Program encompasses missions projects, serving people both domestically and internationally. The Equip Program specializes in training, and subsidiaries throughout the United States. licensing, certification, and ordination of ministers, chaplains, and other leaders. 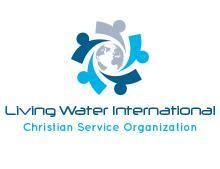 FOLLOW THIS LINK FOR LIVING WATER INTERNATIONAL INC.
Podcasts available on facebook, Blogtalkradio.com and youtube.